Harvey Alfred Veniot, B.A., LLB., Q.C., 93, of the Maritime Oddfellows Home, Pictou, passed away peacefully October 2, 2009, with family at his side. Stevedore, scholar, entrepreneur, lawyer, politician, RCMP officer, Judge (Retired), and genuine people person. Harvey was born in Pictou, a son of the late Alex and Gladys (MacLean) Veniot. He attended local school graduating from the esteemed Pictou Academy as gold medalist. He went on to St. F.X. University taking the then three years B.A. academic program in two years as well as playing three varsity sports. He subsequently attended University of Saskatchewan on a one year scholarship exchange program. Upon return he entered Dalhousie Law School, and was admitted to the Nova Scotia Bar in 1940. After a short stint with the RCMP, he returned home to Pictou to start his legal practice. His quick wit and knowledge of the law quickly gained him the nickname â€˜The Pictou Foxâ€™ in local law circles. His dedication to his community, family, church, and profession, along with his excellent work ethic made him a very respected and well known citizen in local, regional, and national, business and social circles. He entered politics in 1953 at the request of Premier Robert L. Stanfield, and was first elected as a PC candidate in 1956, serving Pictou West for the next 18 years as MLA, under Premiers R.L. Stanfield, G.I. Smith and John Buchanan. 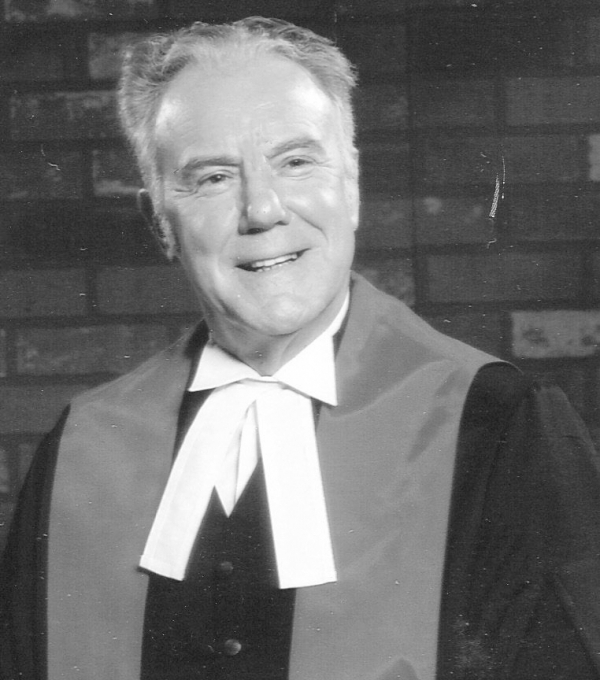 He was appointed Speaker of the Nova Scotia House of Assembly from 1961-1968. Harvey held dual portfolios of Minister of Municipal Affairs and Minister of Agriculture and Marketing from 1968-1974. The greater part of his career was dedicated in trying to effect better situations for the citizens of his beloved Town of Pictou, and the constituency of Pictou West. He was an early supporter of subsidized healthy school lunches, better education opportunities, physical fitness, student loan programs, fair hiring practices, and better health care for Nova Scotians. One of his favourite projects was the finalization of the Pictou Harbour Causeway in co-operation with the NS provincial government and the federal government in Ottawa. It was completed in 1967 at a cost of 10 million dollars. This project created millions of dollars of commerce for Pictou and surrounding areas, affording residents an opportunity to improve job skills, learn new trades, and earn better wages for their families. In 1967 the causeway was officially named the Harvey A. Veniot Causeway as a measure of thanks for his considerable effort on this project. He retired from the practice of law and in 1978 he was appointed to the Magisterial Bench by then Premier Buchanan. He quickly became highly respected for his knowledge of the law, his open mindedness, and fair disposition on court cases. He retired for the second time in 1986. Harvey was a practical man with simple old fashioned values, in his mind no effort or project was a lost cause as long as you gave it your best concentrated effort. He will be greatly missed by his family, his friends and the many, many people he served and assisted over in 70 years. He is survived by son, Stewart (Sheila), Tantallon; daughter, Susan (Ralph), Caribou; grandchildren: Harvey Scott, Peterborough, ON; Shannon (Scott) Holmes, Halifax; Shawna (Jason) Morrissey, Lewis Lake; Aaron Wilson, Westville; Chelsey Wilson, Caribou; second wife, and good friend, Helen (MacLeod) Veniot; great-grandchildren: Spencer and Sawyer Holmes, Bailey Ann Morrissey, and Braden Wilson; many nieces and nephews. He was predeceased by his first wife, and capable partner in all that he accomplished, Rhoda Marion MacLeod. The last surviving member of his immediate family, he was predeceased by brothers, Gerald, Leith, Milton, Peter; sisters, Nellie, Marjorie, Dolly, Fostina, and Helena. Visitation will be held 2-4, 7-9 p.m. Monday in McLaren Funeral Home, Pictou. Funeral Mass will take place 11:00 a.m. Tuesday from Stella Maris Roman Catholic Church, Pictou. Burial will be in Seaview Cemetery.